To Askot on the "Ships starting with A" page. Source: Bjørn Milde's post card collection. Askot, Febr.-1945. Received from Eric Wiberg (original source: U.S. Navy/NARA photo archives). 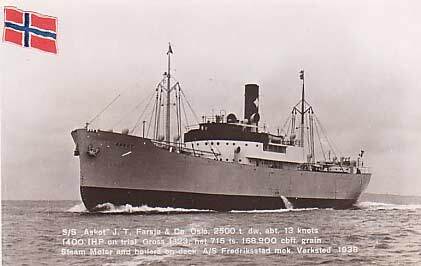 Built at Fredriksstad mek. Verksted, Fredrikstad in 1938. Follow the convoy links provided for more information on each (some of the listings are incomplete). Where the "Convoy" column is left blank, it means that convoy is not known. Nov. 19 Suez   BS 9 For Capetown. Dec. 5* Argentia Botwood Dec. 5 Independent *Page 2 gives departure Dec. 3. (left New York March 28). May 30 Vera Cruz Coatzacoalcos  Independent (See also Page 2). June 29 Halifax St. John's, N.F. July 2 HX 196 Detached to St. John's, N.F. Independent when convoy put back. July 14 Botwood St. John's, N.F.  Independent Page 3 gives arrival July 19. Detached to join SG 9, Sept. 27. *Convoy SG 9 did start out from Sydney, C.B. on Sept. 27, but according to A. Hague's own notes, she had been detached from Convoy QS 37 in order to join this convoy. Febr. 3 New York City Halifax Febr. 6 SC 119 For St. John's, N.F. (Page 3 indicates Alexandria, Va). July 22* Greenland St. John's, N.F. July 28 GS 26 (*Page 4 gives departure July 27, but probably incorrect). Sept. 4 Sydney, C.B. St. John's, N.F. Sept. 7 BW 58 St. John's, N. F. for Greenland. *Convoy HS 116 did arrive Sydney, C.B. on Nov. 14, but as A. Hague says in his next entry, Askot was detached from the convoy that day in order to proceed to Montreal. (Page 5 gives arrival NYC Jan. 30). (stop at Key West not mentioned, Page 5). Aug. 1 Hampton Roads Boston  Independent Page 5 gives arrival Aug. 5. (stop at New York not mentioned, Page 6). Detached indep. to Kingston, Nov. 18. Febr. 4 Hampton Roads Boston  Independent Page 6 gives arrival Febr. 5. According to Page 1 of the archive documents, Askot was on her way from New York to Caibarien when war broke out in Norway on Apr. 9-1940. It'll also be noticed that she had a long stay in New York that summer. Her 1941 voyages also start on this document and continue on Page 2, which also has some 1942 voyages (showing another long stay in New York early on that year). The cargoes she carried ranged from bauxite to raw sugar, cotton and other general cargo. As can be seen, she never made any Transatlantic crossings. She's listed among the ships in the Halifax-U.K. Convoy HX 196 at the end of June-1942, station 75, but was only bound for St. John's, N.F. on that occasion, arriving there on July 2, proceeding to Botwood the next day (Page 2). In the fall of 1942 she made her first voyage to Greenland, having joined Convoy SG 9 (convoy originated at Sydney, C.B. Sept. 27, arrived Greenland Oct. 3 - Askot had sailed from Father Point, Sept. 23). She was bound for Ivigtut, where there was a cryolite mine at the time. Ref. link provided in the above record, the Norwegian Aragon and Brush are also included (see also this Guestbook message). Askot's voyages in this period are shown on Page 3; as can be seen, she returned to St. John's the following month (convoy info in the table above). At the end of that year, she made a voyage from Halifax to St. John's, N.F in Convoy SC 113*, which had originated in New York on Dec. 12-1942 and had Liverpool as its final destination. The Norwegian Hallanger, Henrik Ibsen, Kirsten B (also for St. John's), Lisbeth, Norvarg, O. B. Sørensen, Rio Verde, Ruth I and Titanian are also listed. Askot arrived her destination on Dec. 20, having sailed from Halifax on the 16th. She subsequently remained at St. John's for almost a month (Page 3). A. Hague says she later joined the westbound North Atlantic Convoy ON 158, which had originated in Liverpool on Jan. 2-1943; Askot was not present from the U.K. but joined from Halifax (left Jan. 19, bound for New York). It'll be noticed, when following the link to my page about this convoy, that Askot is not mentioned, perhaps my information is incomplete? A. Hague's listing for ON 158 can be found in the section naming ships in all ON convoys. She returned to Halifax, however (reason not given, but according to Page 3, she lost the convoy; also, the Commodore says bad weather was encountered), then proceeded to New York, where she arrived on Jan. 29, subsequently joining Convoy SC 119* from there on Febr. 3. Again, she did not follow the convoy all the way to the U.K., only going as far as Halifax with arrival there on Febr. 6, later continuing to St. John's, N.F., arriving Febr. 9. From the archive document, we learn that she was bound for St. John's from the start, but lost the convoy and put in at Halifax (twice?) on the way. Other Norwegian ships in SC 119 were Boreas, Iris (also for St. John's only), Iron Baron, James Hawson, Kirsten B (for St. John's) and Primo. Her subsequent voyages are shown on Page 3 and Page 4, with convoy details in the Voyage Record above. 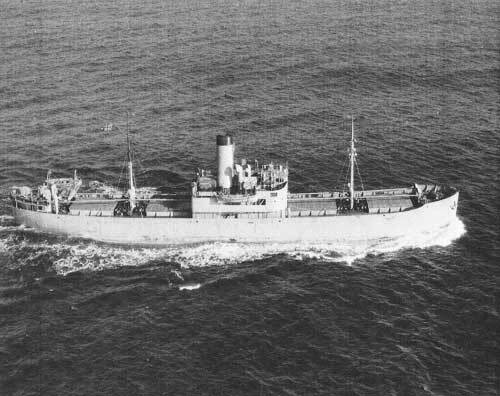 According to Arnold Hague, she may briefly have sailed in Convoy HX 273 at the end of Dec.-1943, bound for Halifax only. He has added a note saying "possibly in this convoy". Note, however, that she's not mentioned on my page about HX 273, where the information is based on the original Advance Sailing Telegram, but again, it's possible the information is incomplete(?) - A. Hague's listing for HX 273 can be found at ships in all HX convoys. Askot had started out from Boston on Dec. 29 (Page 4) and arrived Halifax on the 31st - see Page 5. Her 1944 voyages also start on this document and continue on Page 6, which also has some 1945 voyages, while the rest are listed on Page 7 (to March-1946). Again, convoy information for some of them is available in A. Hague's record above. * The SC series will be updated and completed (including the already existing convoys - some have already been updated), but for now, see ships in all SC convoys. More information on the other Norwegian ships mentioned here can be found via the alphabet index below, or go to the Master Ship Index. According to this external page, she sailed as Attanagalla for Ceylon Shipping Lines Ltd., Colombo, Ceylon from 1957. From 1961 as Hiwind for Northwind Nav. Co., Panama Ltd. (Taiship Co. Ltd), Panama. Renamed Angelina for Doreen Steamship Corp. S.A. (Fuji Marden & Co), Panama in 1964. Sold in Jan.-1968 to Fuji Marden & Co. Ltd., Hong Kong for breaking up. Greenland Convoys - Here's the the main page. Back to Askot on the "Ships starting with A" page.